Sen. Charles Schumer, D-N.Y., joined at right by Senate Minority Leader Harry Reid of Nev., criticizes Republican lawmakers for being too tied to the NRA and the gun lobby, during a news conference on Capitol Hill in Washington, Tuesday, June 14, 2016. Moments of silence rarely become moments of conflict. As Congress returned from a weekend break, however, to the sickening news of the worst mass shooting in U.S. history, common rallying points — moments of silence, classified briefings — instead became opportunities for partisan bickering and dysfunction over gun control legislation. “Pass the bills,” some House Democrats chanted on the House floor Monday night, following a moment of silence in honor of the victims in Orlando. On the Senate side of the Capitol Tuesday, the Republican majority leader said he would oppose measures proposed by Democrats but seemed to leave the door open to some change. "Nobody wants terrorists to have firearms," said Senator Mitch McConnell. "We’re open to serious suggestions from the experts as to what we might be able to do to be helpful." Back on the House side, during a sometimes rowdy session late Monday, other members fled the floor to avoid discussion of three pieces of legislation that House Democrats say would help prevent future attacks, including strengthening background checks and preventing individuals on the terrorist watch list from purchasing guns. Rep. James Clyburn, a Democrat from South Carolina, asked for the opportunity to speak following the moment of silence observed by all members for the victims in Orlando. FILE - U.S. Rep. James Clyburn speaks in Columbia, S.C.
Clyburn, who knew some of the victims of last year's Charleston church shooting personally, told reporters immediately after he wanted to ask the Republican leadership if gun control legislation could be brought up for a vote. His effort reflected an increasing reluctance on the part of House Democrats to treat the death of 49 people in an Orlando nightclub as yet another addition to the list of mass shootings in the United States. Clyburn’s request followed a blistering attack on the House floor Monday from Rep. Jim Himes, a Democrat from Connecticut, who criticized his colleagues for hypocritically observing moments of silence following mass shootings in the U.S. He said the moments of silence were a cover for Congressional inability to react to "bloody tragedy." House Democrat Minority Whip Steny Hoyer told reporters in a briefing Tuesday morning that moments of silence should be followed by action. “We believe it appropriate that these words and moments of silence would be followed by legislation, certainly to enhance background checks, to close loopholes, that if you're on the no-fly list, you can't buy guns — no fly, no buy — weapons, which are sold freely, which have the capacity to kill large numbers of people very quickly. ... We cannot and must not remain silent," said Hoyer, of Maryland. He acknowledged the possibility that House Democrats could bring gun control legislation up for a vote by adding amendments to spending bills, but he said it had not yet been decided. That could be a difficult process, though, following last month’s Congressional battle over several spending bills. Their passage is endangered by the addition of amendments and counter-amendments involving rights for LGBT federal contractors. The fight prompted House Speaker Paul Ryan of Wisconsin to move away from an open-rule process that allows members to introduce amendments that can endanger bills. 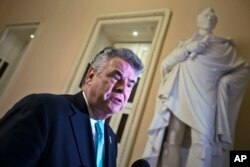 FILE - Rep. Peter King (R- NY) speaks to reporters on Capitol Hill. Rep. Peter King, a Republican from New York, told VOA on Monday he did not think his bill preventing individuals on the terror watch list from purchasing guns could be revived, even in the wake of the Orlando shooting. "No. I put the bill in. I support it. But the fact of the matter is it's not going to pass now,” King said. Divisions over gun control only continued Tuesday as House members received a classified security briefing from Homeland Security Secretary Jeh Johnson. “A members’ briefing that immediately turns to questions of partisanship is unfortunate,” said Rep. David Jolly, a Republican from Florida, who said he left the briefing because of the tone. People leave flowers and other items at a makeshift vigil outside the Orlando Regional Medical Center, which is close to where the mass shooting occurred at the Pulse gay nightclub early Sunday in Orlando, Florida, June 14, 2016. “This is a week that we are one nation, mourning together, and if we can’t arrive at a consensus together and reject this Democrat, Republican divide, we all lose,” Jolly said. The Orlando attack prompted Senate Republicans to demand a stepped-up campaign to defeat the Islamic State group, the group to which shooter Omar Mateen pledged allegiance during his rampage at the Pulse nightclub. Democrats, meanwhile, are joining forces with their House colleagues to revive long-stalled legislation restricting gun sales and introduce new ones. As in the House, Senate Democrats want to ban those on the FBI’s terror watch list from purchasing firearms, a proposal Republicans blocked late last year. In addition, Democrat Bob Casey of Pennsylvania wants to bar those convicted of hate crimes from buying a gun. “I think we should make a determined effort to take steps to reduce the likelihood that these kinds of [mass-shooting] incidents will occur, and that means taking action,” Casey told VOA. “It doesn’t mean just giving speeches. 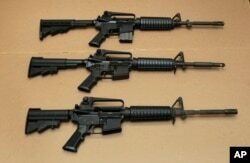 FILE -- Three variations of the AR-15 assault rifle are displayed in Sacramento, Calif. Senator Bill Nelson of Florida, who spent much of Sunday in Orlando after the attack, is among many Democrats who want to go a step further and reinstate a federal ban on assault weapons. 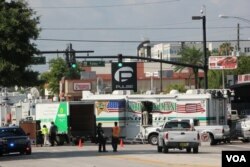 But Nelson expressed skepticism that the Republican-led Congress will enact any gun control measures. Republicans insist their objection to gun laws is grounded in hard facts. Could New Gun Laws Closing 'Terror Loophole' Prevent Mass Shootings?